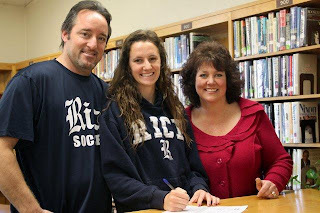 Congratulations to Senior Becca Koval who signed her NCAA Letter of Intent to play soccer at Rice University in the Fall. Becca is the Regents' four-year varsity starter, twice named the Most Valuable Player and has served two seasons as the Regents' team captain. Becca scored 40 career goals with 26 assists. Becca chose to attend Rice over Harvard, Vanderbilt and Clemson. Becca said, "I chose Rice because of the elite academics and quality soccer program. The coaches and team presented an atmosphere that made me feel at home. I knew it was the right place for me!" Becca is pictured signing her letter of intent with her father, Jeffrey and her mother Lisa. Way to go, Becca. You deserve it!